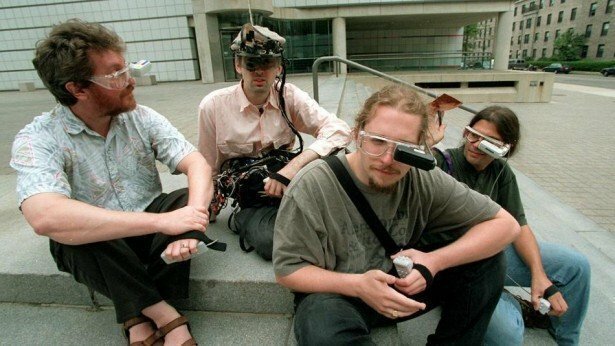 20 years before Google Glass was even a thought in Sergey Brin’s mind, Thad Starner was at MIT innovating wearable computers. Thad Starner is a considered by many to be the grandfather of wearable computing, as well as augmented reality environments, pattern recogonition and human-computer interaction. Starner is an advocate of continued use computable wearable glasses and has worn his own invention everyday since 1993. His doctoral work at MIT (Massachusetts Institute of Technology) was entitled “Wearable Computing and Contextual Awareness” and it deals with pattern recognition and how wearable computing can have many practical uses such as in recognizing American Sign Language. Benefits of Starner’s wearable computing include being able to walk around and access the Internet and taking notes on a real time conversation without losing eye contact. You can also open up notes on a topic and add to a conversation based on what you can find on the internet in real time. Starner claims to have a speech impediment and that having wearable glasses allows him to speak more fluently.